I hope everyone is having a wonderful week so far! I can’t believe that this week is Thanksgiving. It came so fast! I wanted to share with you a fun Coastal Bohemian Thanksgiving Tablescape! I started out with inspiration from my macrame table runner. I then gathered eclectic pieces including, bottles of different shapes, sizes and colors. I also found Bowls at my local Homegoods with different patterns and clear glass plates. Flowers are a great finishing touch to the design of your table. I chose a mixture of white, yellow and green to enhance the blues and aquas of the tablescape. Geometric napkins in soft hues compliment the neutral table runner and dining table. I love how every bottle was different and had a unique mixture of flowers to complete it’s look. Layerings of plates with soft aquas and clear etched glass gave my place setting an eclectic feel. I hope everyone has a wonderful Thanksgiving! Thanks so much for stopping by! 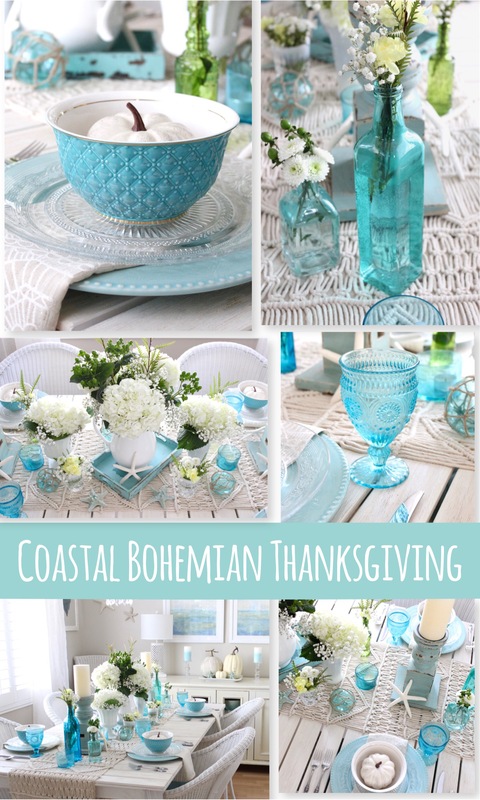 Shop a similar Coastal Bohemian Thanksgiving below! Quite charming. What a beautiful ‘view’ for Thanksgiving. I feel the sun, surf and sand by just gazing at your tablescape. You have quite a talent Breezy Designs. Thank you so much! Happy Thanksgiving to you! Thank you so much sweetheart! xo! I’m from Italy. Where can I find them? Hi Serena! Thank you for stopping by. In some of my posts, I have linked where I purchased them in the bottom of the post. My Home: Before and After!